So sorry I've been away for awhile. My new internship, while awesome, is keeping me crazy busy and my sister's bat-mitzvah just passed. You can only imagine the stress in the run-up to that! 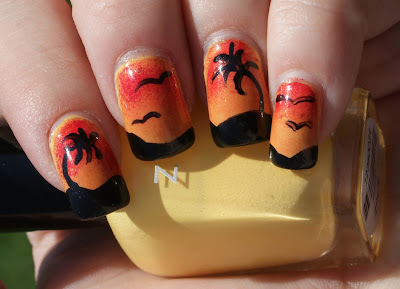 Today, I'm returning with a Sunset Beach. 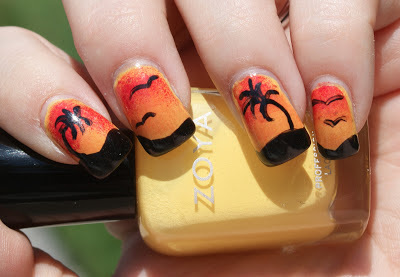 I used Zoya Pippa, Lianne, and Elisa for the gradient, with Zoya Raven for the palm trees. Originally, I didn't use Zoya Elisa. But I thought the nails needed some extra pop. But man oh man, was this a hit! And surprisingly, it was incredibly easy to remove! 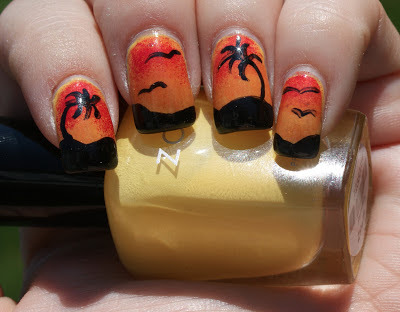 What do you think of my Palm Beach Sunset nails? Wow, this is impressive! What did you use to make the design? This is really pretty! I love the colors together!